I've just been to space and back, at least that's what it feels like. Having completed emergency egress and sea survival training last week, my fellow Astronauts for Hire and I next made our way to The NASTAR Center in Southampton, Pennsylvania just outside Philadelphia. There, we spent three days undergoing the Suborbital Scientist Training Program, which provides a good foundation in space physiology for prospective scientist-astronauts. 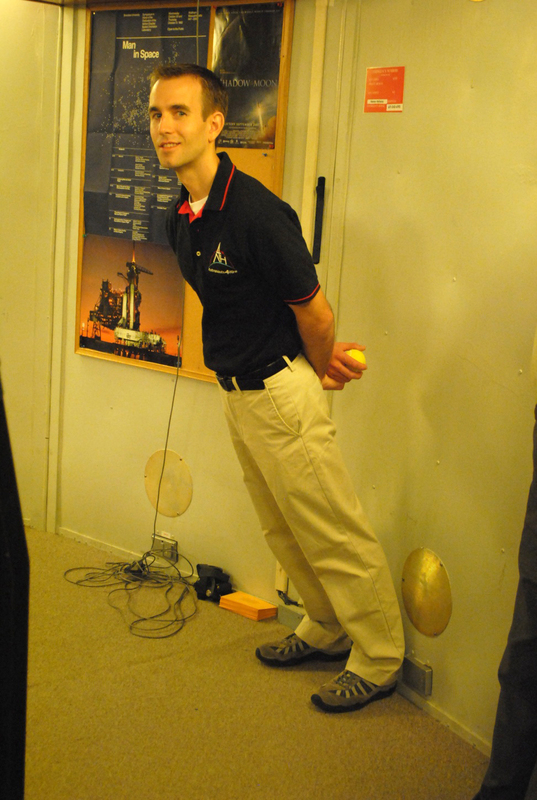 Following the NASTAR program, we went to the Ashton Graybiel Spatial Orientation Laboratory to learn how unusual force environments affect the body's vestibular system. Following a tour of the NASTAR Center, we spent the morning of the first day in the classroom learning about human physiology at high altitude. For the most part, we focused on how the low oxygen conditions of the upper atmosphere can lead to hypoxia. This prepared us for the afternoon activity where we took a ride in NASTAR's hypobaric chamber. The main purpose of the exercise was to give the participants a chance to experience the symptoms of hypoxia under safe, controlled conditions so that later if we ever are exposed to a low oxygen environment we can recognize the effects it will have on us. After pre-breathing oxygen at ambient pressure for half an hour, the air in the chamber was evacuated until we reached 25,000 feet equivalent pressure. If that were a mountain, it would be one of the world's tallest. Next, we removed our masks and proceeded to fill out a worksheet with simple logic and math problems. By the end of the 5 minutes I started to feel some tingling in my finger tips and a general warming of my body, which are early signs of hypoxia. Overall, however, I fared very well. I've run and hiked up to the Continental Divide in short spans of time without ever feeling ill effects, so this wasn't a big surprise to me. Then, we "descended" to 18,000 feet equivalent pressure and once again took off our oxygen masks. This time we tested our color perception by observing a color wheel both without and with oxygen assistance. I was struck by how fast the colors immediately changed when I put my oxygen mask back on. They went from being very saturated with no mask to much lighter and more washed out with oxygen (which is the actual color). 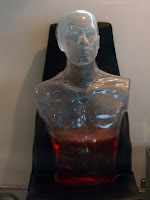 Throughout the hypobaric chamber runs, we also experienced cooling and warming of the air as it expanded and compressed with the evacuation and introduction of air to the chamber. Later, after we'd left the chamber, the NASTAR instructor cranked down the pressure to an equivalent of 62,000 feet altitude. That is well above the Armstrong Line where blood boils. 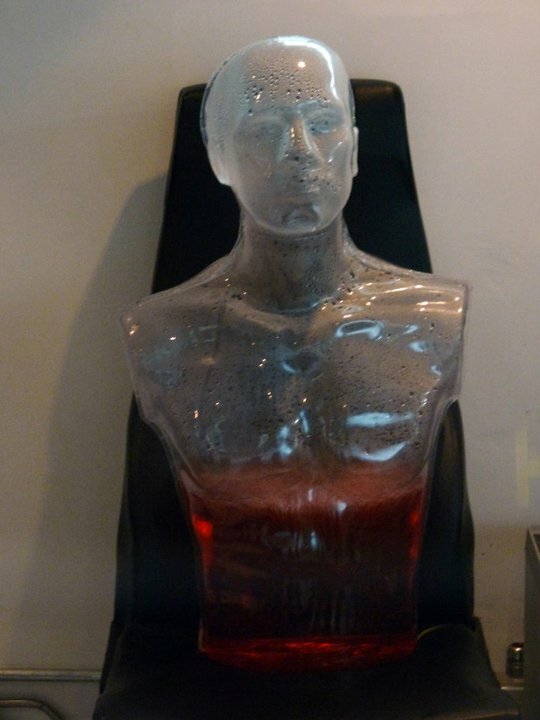 We got to watch the phenomenon in action in a clear plastic mannequin filled with red-dyed water. The main attraction at the NASTAR Center is its centrifuge. Known at the Space Training Simulator (model STS-400), this high performance centrifuge has a 25-foot arm with a gimbaled gondola at the end that can rotate dynamically as the centrifuge spins to simulate different force directions. This means the centrifuge can very accurately reproduce the various phases of spaceflight from launch to re-entry. 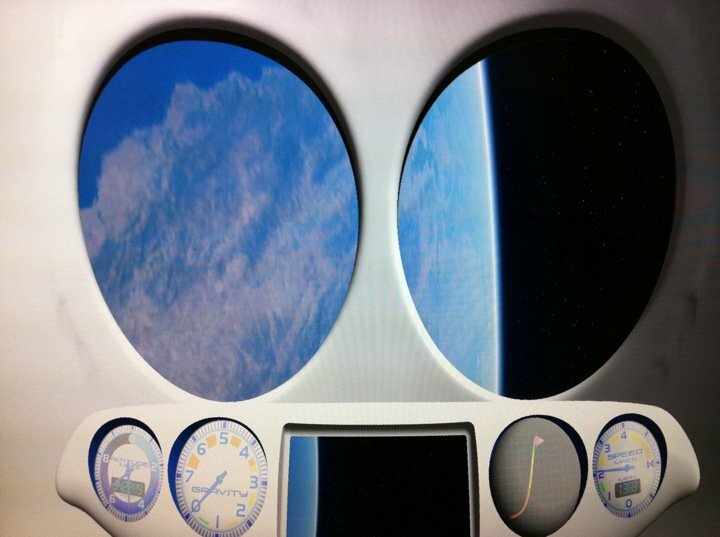 Human subjects sit strapped into a five-point harness inside the gondola, which is configured like the cockpit of a space vehicle, complete with displays depicting what one would see out the windows during a real flight. 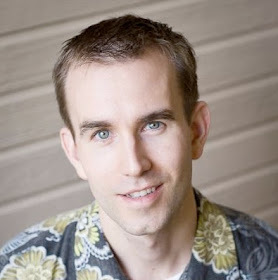 The net effect is a very realistic environment that enriches the experience. It makes you feel like you're going to space! In the morning classroom session, we learned about the symptoms and physiological effects of G forces, especially Gravity-induced Loss of Consciousness (G-LOC). G-LOC occurs when extreme G forces cause blood to drain away from the brain, inducing hypoxia due to the resultant lack of oxygen. We learned the Anti-G Straining Maneuver (AGSM) to increase G tolerance and avoid severe G-LOC symptoms during our centrifuge runs. The AGSM involves straining all of your lower body muscles while aggressively holding 3-second breadths with quick, deliberate exhalations. This forces blood and oxygen upward to the head where they are needed. Armed with our knowledge and the AGSM, we next endured four separate Gx and Gz "flights" in the centrifuge to evaluate our ability to tolerate exposure to those forces. Gx is when the force is through your chest and feels like an elephant is sitting on you. Other than the pressure and difficulty breathing, it's not too bad. Gz is when the force passes from your head to your toes. 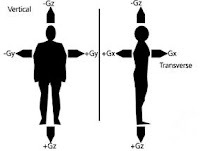 Positive Gz causes blood to quickly pool in the feet leaving the head oxygen-starved and eventually leads to G-LOC. Thus, the AGSM is most important during times of high Gz. Gz is the dominant force during launch, and Gx is dominant during re-entry for a Virgin Galactic flight profile. I experienced some gray-out and tunnel vision during the 3.5 Gz centrifuge run, but as soon as I increased my AGSM efforts, those symptoms went away. 6.1 Gx was no problem for me. To see the centrifuge in action, check out the video below. On the third day we embarked on two simulated missions along the actual flight profile of SpaceShipOne. The idea is that this will be similar to what SpaceShipTwo will experience. Since we are training as suborbital scientists rather than tourists, we created and followed a checklist of tasks to perform during the mission simulations. The procedure involved monitoring the gauges and calling out the G-force, altitude, and speed at critical phases throughout the flight. During the "weightless" portion, we each chose an activity to complete. Most of us opted to pull out our cell phones and snap photos out the "windows." 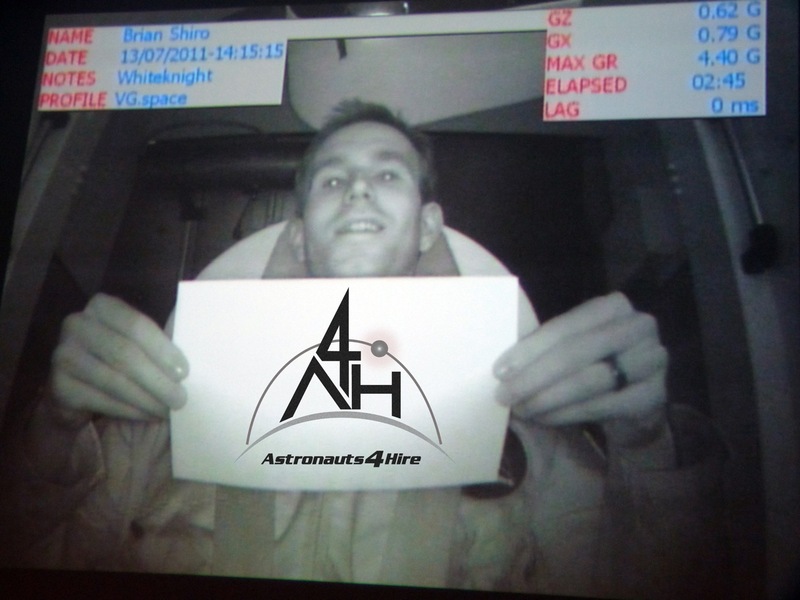 On one of the flights, I held up an A4H sign to the cockpit's video recorder. In future refresher training centrifuge flights, I could forsee doing more complex tasks more akin to actual experiments. The flight was a rush! After being dropped from the White Knight mothership, the rockets ignite producing an initial horizontal acceleration followed quickly by very intense vertical acceleration about 4Gz. Despite my best AGSM efforts, I had a great deal of greyout in my vision for about a second. After the worst of the Gz force subsides, you are riding on your back upwards experiencing moderate Gx in your chest until the engines cut off, leaving the spacecraft to coast into space for the microgravity portion of the flight. Of course, the centrifuge can't simulate actual zero gravity, but the deceleration and tilting of the gondola make it feel close enough. Throughout this process, I was reading off values from the gauges according to the checklist to ensure I had good situational awareness and focus to complete the experiment. The screens in front of me showed the beautiful curved limb of our planet and the stars beyond as the spacecraft rolled towards its apogee at about 110 km altitude traveling at mach 3.5. A scant few minutes later, the G's came back in force as the spacecraft feathered its wings and aero-braked through the upper atmosphere. 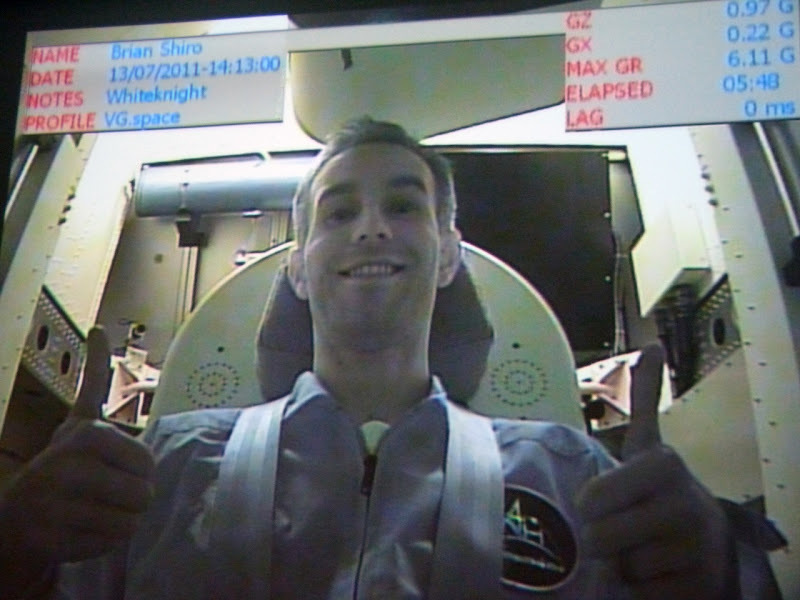 The peak reached slightly over 6Gx during the re-entry, just as I had practiced in the centrifuge the day before. Here I am just after I "landed" from the experience. I wanted to go again. During lunch on the third day I was also surprised with a birthday cake! 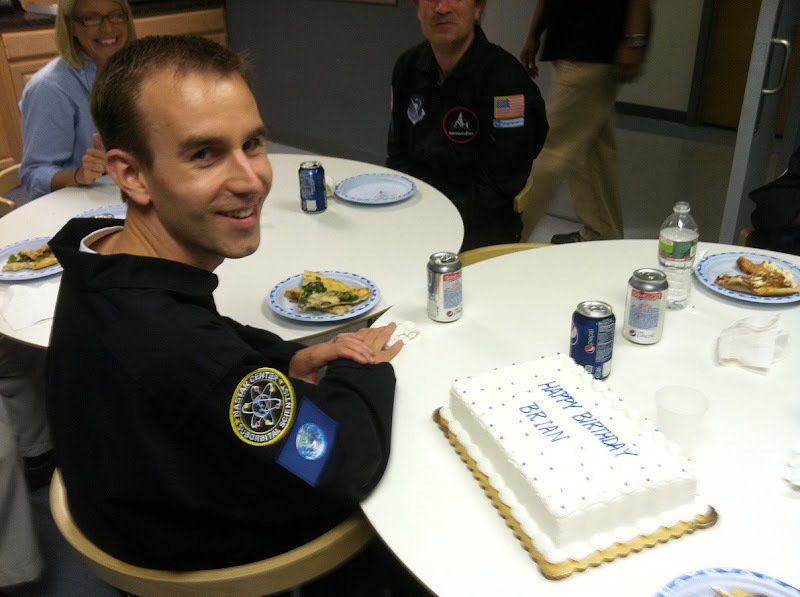 One of my fellow A4H had conspired with NASTAR to get me a cake in honor of my 33rd birthday. We joked that training was a "piece of cake." All good things must come to an end. 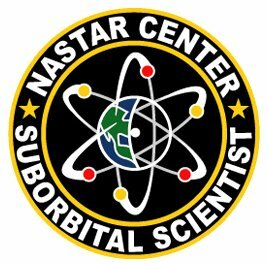 I'm happy to say that we all graduated from the NASTAR Center Suborbital Scientist Training Program with flying colors. 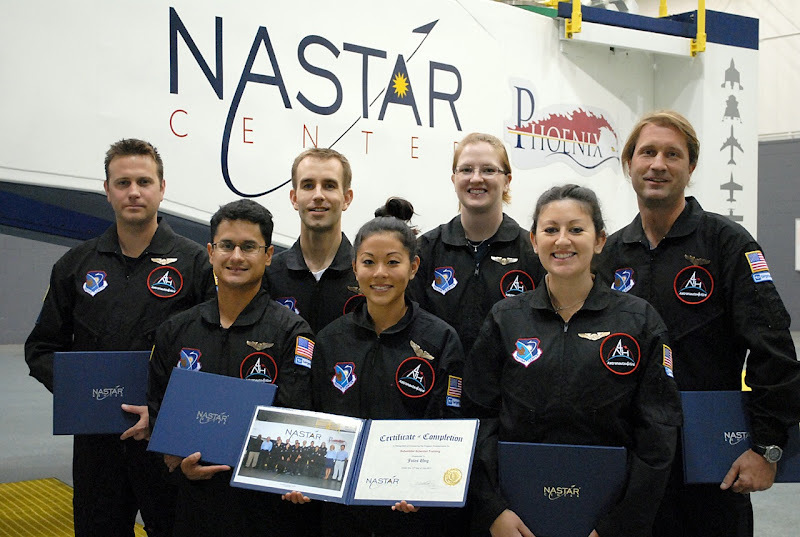 We were awarded very nice certificates of completion and our own NASTAR wings to symbolize the accomplishment. 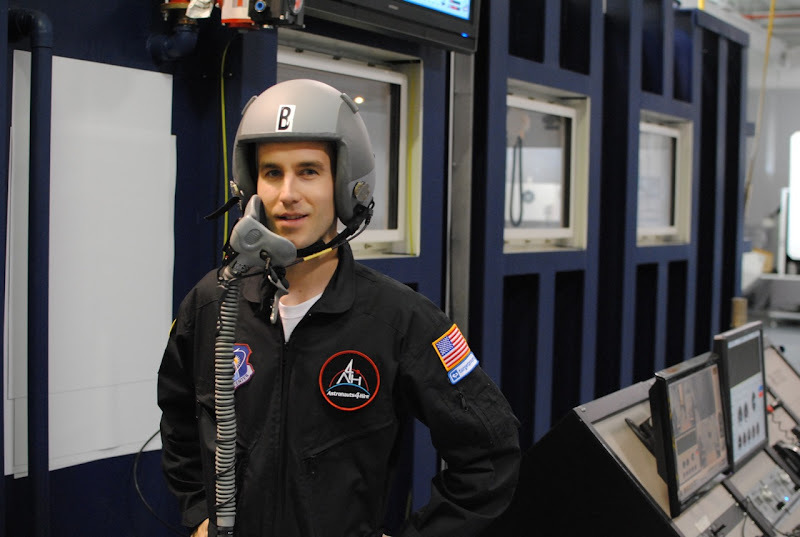 The next stop on our East Coast astronaut training regimen was the Ashton Graybiel Spatial Orientation Laboratory (AGSOL) at Brandeis University near Boston. Whereas NASTAR very effectively covered the launch and re-entry portions of spaceflight, the AGSOL visit helped us appreciate the preparation necessary for the microgravity portion of the flight itself. After all, with only 4-5 precious minutes of time in space, you can't afford to spend you flight disoriented or sick. Researchers - particularly those hired by third parties like A4H - must ensure they can do the job in that short timespan despite problems like space motion sickness. We spent the day at the AGSOL learning about their research and testing their equipment. The main focus was understanding our individual susceptibility to space motion sickness and ways to manage it. In AGSOL's three decades of work, they have learned that everyone falls on a bell curve from a few who never get sick no matter what happens to them, to the majority who do experience symptoms but can mitigate them, to a few who just can't be helped. When one is developing the world's first commercial astronaut crew service, one especially wants to know if anyone falls in the latter group, which is a select-out criterion. Luckily, we were all average to better than average in terms of motion sickness susceptibility. Our attention focused on two unique facilities at the AGSOL. The first was the Rotating Room, which is 22-foot diameter cylindrical room that can be spun to induce up to 4G in the periphery. The resultant centripetal force added to gravity's normal vertical vector, leads to a combined new "normal" gravity at an angle to vertical, as you can see from the photo to the right here. We tossed balls around to see the effect of the Coriolis force and experienced first hand how slight head movements - especially vertical ones - can confuse the vestibular system and induce motion sickness symptoms like pallor, sweating, and nausea. The good news is that the more time you spend in devices like this, the greater your adaptability to space motion sickness. While I felt fine, after about half an hour spinning in the room, the AGSOL experts told me that color was draining from my skin. The next facility we tested was the Multi-Axis Tilt Device, affectionately known at the "HULK" due to its large size. This one-of-a-kind piece of equipment can spin on three axes to induce movement in any direction. The AGSOL uses it to test spatial perception as well as motion sickness. 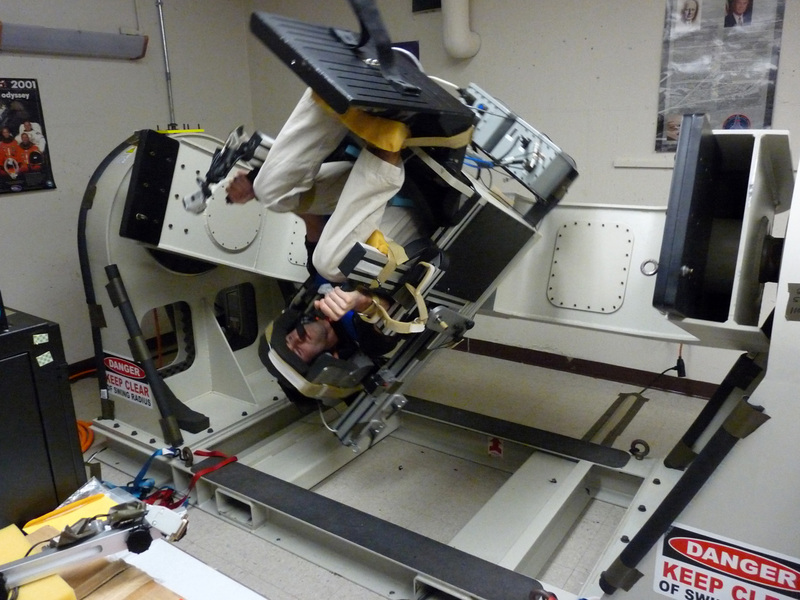 After being strapped into the 5-point harness with additional head, arm, hand, and foot restraints, I was at the mercy of the machine operators. They asked me if I wanted to ease into it or just go all out as if the spacecraft had lost control. I said to surprise me. They quickly spun me up to the machine's full speed (about 3G) and rotated it in every possible direction. At regular intervals, they asked how I was feeling on a scale of 1 to 10. I answered 0-1 each time; I never felt sick. After about 15 minutes spinning at the machine's top speed, I heard a "Congratulations" through the helmet speaker. I had maxed out its capabilities and emerged unscathed. Of course, they could have made it much more provocative by blindfolding me and focusing on just one axis of rotation at a time. This training puts me well on my way to being a competitive commercial astronaut. 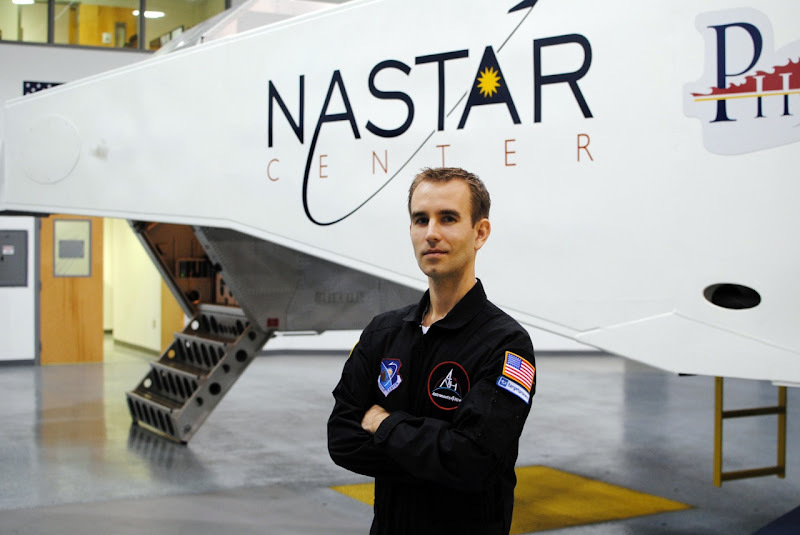 Future training activities include parabolic microgravity flight, aerobatic unusual attitude flight, and some additional academic learning on the space environment and spacecraft systems.